Phillip Maywald was born on March 10, 1941, in Texas. He entered the U.S. Air Force Academy in June 1959, and was commissioned a 2d Lt on June 5, 1963. Lt Maywald next attended Undergraduate Pilot Training and was awarded his pilot wings at Reese AFB, Texas, in October 1964, and then completed B-52H Stratofortress Combat Crew Training before serving with the 720th Bomb Squadron at Minot AFB, North Dakota, from April 1965 to July 1966. His next assignment was as an O-2 Milirole forward air control pilot with the 23rd Tactical Air Support Squadron at Nakhon Phanom Royal Thai AFB, Thailand, and with the 606th Air Commando Squadron at Udorn Royal Thai AFB, Thailand, from August 1967 to August 1968. Capt Maywald next served as an F-4 Phantom II pilot with the 36th Tactical Fighter Wing at Bitburg AB, West Germany, from August 1968 to June 1971, followed by an Air Force Institute of Technology assignment to complete his Master's degree in aerospace engineering from June 1971 to March 1973. Maj Maywald served as an aeronautical engineer and aircraft weapon system analyst with the 4900th Test Group, Headquarters U.S. Air Force Test and Evaluation Center, at Kirtland AFB, New Mexico, from March 1973 to October 1976, and then served as an instructor pilot with the 90th Flying Training Squadron at Sheppard AFB, Texas, from October 1976 to April 1981. 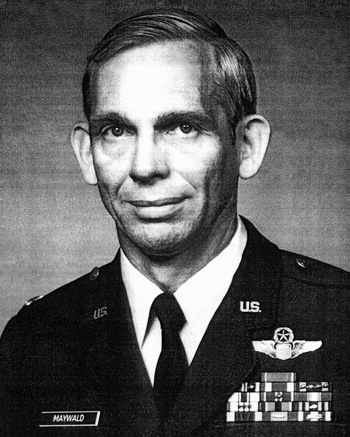 Col Maywald's final assignment was as a director and program manager with the Arnold Engineering and Development Center at Arnold AFB, Tennessee, from April 1981 until his retirement from the Air Force on May 1, 1984. 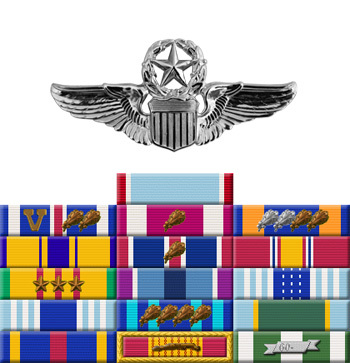 The President of the United States of America, authorized by Title 10, Section 8742, United States Code, awards the Air Force Cross to Captain Phillip V. Maywald for extraordinary heroism in military operations against an opposing armed force as an O-2A pilot in Southeast Asia on 21 May 1968. On that date, Captain Maywald braved an intense and deadly barrage of hostile gunfire for over two hours while he controlled the successful rescue of a fellow pilot who had been downed by antiaircraft fire deep within hostile territory. Despite the great personal risk involved to his own life, Captain Maywald, with undaunted determination, indomitable courage, and professional skill, repeatedly made low passes over the rescue scene in his light unarmored observation aircraft. Due to his courage, persistence, and professional skill the downed pilot was safely recovered. Through his extraordinary heroism, superb airmanship, and aggressiveness, Captain Maywald reflected the highest credit upon himself and the United States Air Force.